A hacker calling himself “KEEMSTAR”—in reference to a YouTube star—has made the latest attack on a law enforcement agency. This time, it’s the Peel Regional Police force in Canada that’s the victim. 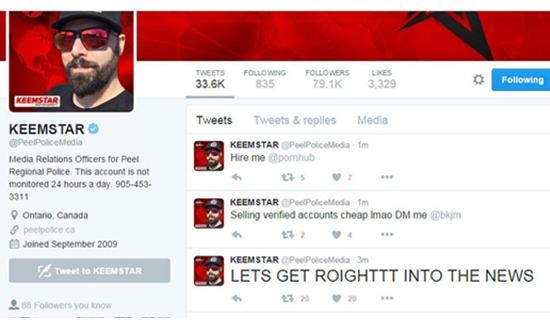 The Peel Regional Police’s official Twitter account was suspended Monday night after someone claiming to be “KEEMSTAR” apparently hacked the account and began posting vulgar messages. “KEEMSTAR” is the online name used by Daniel Keem, a somewhat controversial YouTube star with a reputation for online gossip. Keem claimed in a video posted to his own Twitter account shortly after the hack that he isn’t responsible for hacking the Peel Regional Police’s Twitter account. He suggested that whoever targeted his accounts may also have been responsible for a recent hack against pop star Katy Perry. The account was back in the hands of police, and resumed tweeting on Tuesday morning, May 31.